Library of America, 9781598530469, 960pp. Raymond Carver's spare dramas of loneliness, despair, and troubled relationships breathed new life into the American short story of the 1970s and '80s. In collections such as Will You Please Be Quiet, Please? and What We Talk About When We Talk About Love, Carver wrote with unflinching exactness about men and women enduring lives on the knife-edge of poverty and other deprivations. Beneath his pared-down surfaces run disturbing, violent undercurrents. Suggestive rather than explicit, and seeming all the more powerful for what is left unsaid, Carver's stories were held up as exemplars of a new school in American fiction known as minimalism or "dirty realism," a movement whose wide influence continues to this day. Carver's stories were brilliant in their detachment and use of the oblique, ambiguous gesture, yet there were signs of a different sort of sensibility at work. 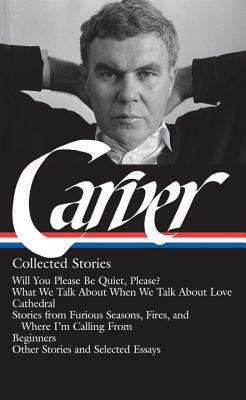 In books such as Cathedral and the later tales included in the collected stories volume Where I'm Calling From, Carver revealed himself to be a more expansive writer than in the earlier published books, displaying Chekhovian sympathies toward his characters and relying less on elliptical effects. In gathering all of Carver's stories, including early sketches and posthumously discovered works, The Library of America's Collected Stories provides a comprehensive overview of Carver's career as we have come to know it: the promise of Will You Please Be Quiet, Please? and the breakthrough of What We Talk About, on through the departures taken in Cathedral and the pathos of the late stories. But it also prompts a fresh consideration of Carver by presenting Beginners, an edition of the manuscript of What We Talk About When We Talk About Love that Carver submitted to Gordon Lish, his editor and a crucial influence on his development. Lish's editing was so extensive that at one point Carver wrote him an anguished letter asking him not to publish the book; now, for the first time, readers can read both the manuscript and published versions of the collection that established Carver as a major American writer. Offering a fascinating window into the complex, fraught relation between writer and editor, Beginners expands our sense of Carver and is essential reading for anyone who cares about his achievement. William L. Stull, editor, is professor of English at the University of Hartford. Maureen P. Carroll is adjunct professor of humanities at the University of Hartford and a practicing attorney. With William Stull she has devoted more than two decades to the work of Raymond Carver, publishing numerous essays and editing Conversations with Raymond Carver (1990), Remembering Ray: A Composite Biography(1993), All of Us: The Collected Poems (1996), and Call If You Need Me: The Uncollected Fiction and Other Prose (2000).